A reflection on this week’s readings. It’s been more than four years since I’ve returned home from my time as a Franciscan Mission Service missioner in Zambia. Many times since then I’ve been asked the same question “how did mission change you?” At first it was difficult to think of any part of me that mission didn’t change, but the more I reflect on it, the clearer my answer has become. More than anything else, mission taught me to trust God – and that trust has changed everything else about my life. I probably would have told you that I believed God is trustworthy even before I packed my bags for Zambia, but now I can say that this truth has sunken into the deepest parts of me. I learned to trust in the same way Peter did. He did the impossible and stepped out on the water, but so soon after experiencing that miracle he began to doubt that out there on the rough waves was where God really wanted him to be. 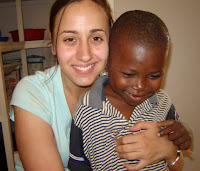 For the first year of my mission, I lived and worked in an orphanage for children under the age of seven. Most of them lost their parents at this young age to AIDS. I was put in charge of twelve two and three-year olds. I can remember, very vividly, the first time I had the task of putting those twelve kids to bed all by myself. After I successfully gave each of them a bath and dressed them in their pajamas, it was time to coax all twelve of them into their cribs. Here is where I started feeling like Peter, a few miles offshore, in the middle of a raging storm. Kids were running in circles all around me, definitely more in party-mode than sleepy-time mode. I managed to plop each of them into a crib and thought that if I turn out the lights and close the door, then just maybe they would quiet down. I sat outside their bedroom door for a few minutes and struggled to catch my breath. To my dismay, the noise wasn’t stopping. I normally enjoyed the sound of the kids singing and laughter, but at bedtime after an exhausting day, I just wasn’t in the mood for it. I peeked in to let them know I was watching them – and to my horror I saw that they had all removed all the bedding from their cribs and tossed it into the middle of the bedroom floor. Of course, the kids thought it was hilarious, and started laughing even louder when I came in the room. Having only a limited grasp on the local language, I wasn’t even able to let the kids know that they had done something wrong. I was defeated and frustrated. As I remade the beds, I began to doubt that I was cut out for this mission work. I could list all the reasons – I was too young, unable to speak their language, had no parenting experience, I missed home a lot, and most importantly – twelve kids was just too much for any one person to handle! In my moment of doubt, I was unable to remember the growth that I had witnessed in these children. I didn’t think about three-year old Patricia, who was finally starting to come out of her shell after grieving the death of her mother or Roger, the HIV-positive boy, who after several months of love and good food, was able to revert his status to HIV-negative. I forgot that within those twelve tiny and noisy bodies were twelve little miracles that I was so blessed to spend my days with. Everyday God was enabling me to be a part of something that was truly amazing. It wasn’t because of my qualifications (I was right when I said this work wasn’t within my own strength) but, because I made myself available, God was able to work through me. In a similar way Peter found himself in the middle of the ocean and realized that he didn’t have the ability to walk on water. He doubted that God would give him the ability to do the impossible. This scenario repeated itself almost daily during my three years in Zambia, often in most serious circumstances than just misbehaving toddlers. Thankfully, God was patient with me in my doubt and was right there to teach me this lesson over and over again until I really started to understand that I could trust God completely. Through mission and full-time volunteer work, we have the extraordinary opportunity to lose ourselves (and our insecurities, fears, and doubts) in service to God’s people. Just about every missioner and former volunteer will agree – you gain far more by serving than you receive. After you say yes to the call to service, your life will surely take on a new and exciting direction. Take a moment today to reflect on the ways God may be asking for your trust. Will you say yes to the call to serve?